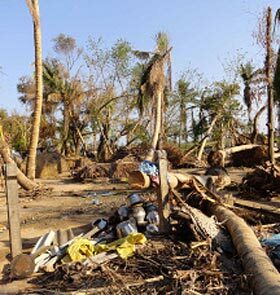 CARE TODAY appeals for support to those affected by the cyclone. Cyclone Thane, a severe storm with a wind speed of 140 kmph, hit the Indian coast on December 30, 2011. Seven hundred and thirtyfive villages in Cuddalore and Villupuram districts of Tamil Nadu and Puducherry were severely damaged. The cyclone left 48 dead, damaged over two lakh houses, 15,000 hectares of standing paddy crop, 6,000 hectares of sugarcane plantation, 2,000 hectares of cotton plantation and 500 hectares of coconut plantation. The lives of fishermen and farmers were thrown out of gear. Damage to homes, drinking water and power lines has enhanced the vulnerability of the surviving women and children. The 153 children living in SOS Children’s Village, Puducherry, which was set up in 2005 to cater to the needs of the 2004 tsunami orphans, held their breath as they witnessed nature’s fury yet again. The cyclone wreaked havoc on the village, destroying 15 homes, a medical centre, a community centre, a kindergarten school and 36 houses of poor families living in the vicinity. Gale force winds blew the tiles off their roofs, damaged wood and plumbing work and destroyed books, preventing children from going to school. These children need help to rebuild their homes. It is an enormous task and your support is what can make a difference. The estimated cost of repairing the SOS Children's Village itself is Rs 1.6 crore. Care Today Fund appeals for generous contributions from the readers of India Today to support the restoration of SOS Children’s Village and other needs of the affected communities. Copyright © 2019 India Today Group. All Rights Reserved. India Today Group Online is a Registered trademark of the India Today Group. For reprint rights: Syndications Today.